Are you thinking of buying a home? If so, one of our upcoming home buying seminars may be a great place to start. Vermont Federal and Four Seasons Sotheby’s International Realty will walk you through the complete home buying process and answer any of your questions. 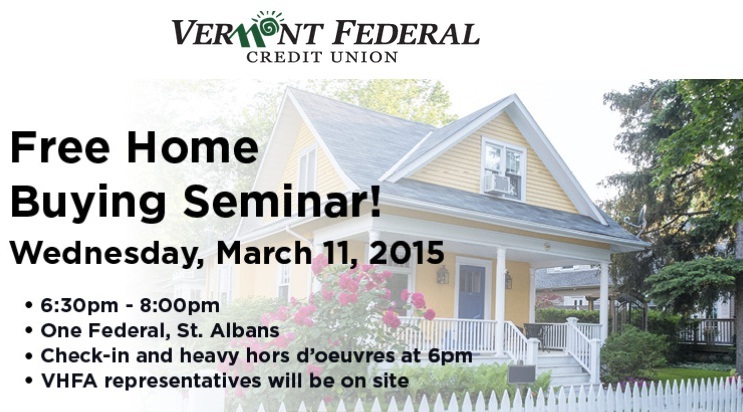 Vermont Housing Finance Agency (VHFA) will also be onsite to answer questions. Check-in and refreshments will beign at 6PM, followed by the presentation at 6:30PM. If you would like to attend, please e-mail marketing@vermontfederal.org with the name(s) of attendee(s) and location before the RSVP date below.